Our in-depth knowledge and industrial expertise enable us to offer a distinguished range ofInterlocking Tiles Making Machine. 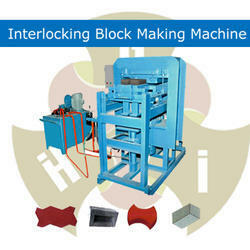 This is used for making Concrete Interlocking Tiles, Cement Tiles Making Machine. Owing to its unique features such as easy operation, optimum performance, the provided machine is highly acknowledged among our patrons. At our production unit, this is manufactured using high class components and ultra-modern techniques in adherence to defined industry norms.Its also known as Concrete Block Making Machine. We are offering high range of interlockinng tiles making machine including full setup as vibrating table, color pan mixer, concrete mixer plastic mould, rubbber mould, hardener etc. GHI are manufacturing hydraulic machine from 1990. we build a trust on customer for our quality machine and products.we have high range of interlcoking block making machine. We provide an exclusive range of Interlocking Brick Making Machine to our clients, which are designed using latest technology. Our range of these machines is used in several industries and is available in various specifications. All the products are designed & developed under the supervision of experts. These Brick Making Machines are renowned for salient attributes like high performance, easy fittings and high durability. Clients can avail our range at competitive prices.